John is the founder of Long White Cloud Qigong and Kung Fu, and author of several popular books on qigong. He has taught qigong on every continent around the globe and has students all over the world. 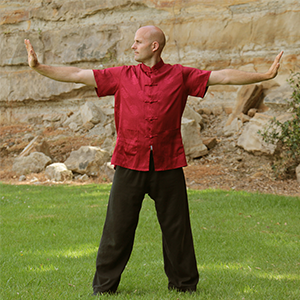 John teaches qigong in a very practical way, and has a passion for helping people to apply qigong principles to their daily lives and feel the flow of qi in all of their activities. Come and get your qi flowing on Saturday mornings. A variety of exercises will be explored, including practices that balance your posture, emotions, and organ functions, practices for connecting to Heaven and Earth, Walking Qigong, Zhang Zhuang, and others. Practical self defence using the techniques and philosophy of traditional southern five animals kung fu. Tiger, snake, crane, leopard, and dragon each teach different strategies and develop different physical characteristics and skills.